It's a very special day for me. love is just as fresh as it was 56 years ago. dance in our kitchen later in the evening. in the center to put a straw through. I made the frosting thick as syrup and poured it over the cookies. Let the cookies sit on a rack for six hours or overnight. New England Confectionery Company, or Necco. Aren't you the clever one! Eating a cookie at the same time having a swallow milk is genius. Your cookies are pretty and how I would love one right now with a glass of cold milk. Delightful post and clever to put the straw through the cookie. Bet we'll see on Pinterest many times. What a fun and lovely post to both read and look at. I have never seen cookies on top of the bottle like that. I will have to copy that charming idea. Wishing you the best and many more memories in the making. Oh, I don't how you came up with that, but it's so adorable! I'm so glad there are "happily ever afters..."
Love the light pink cookies!!! YUM! So pretty. 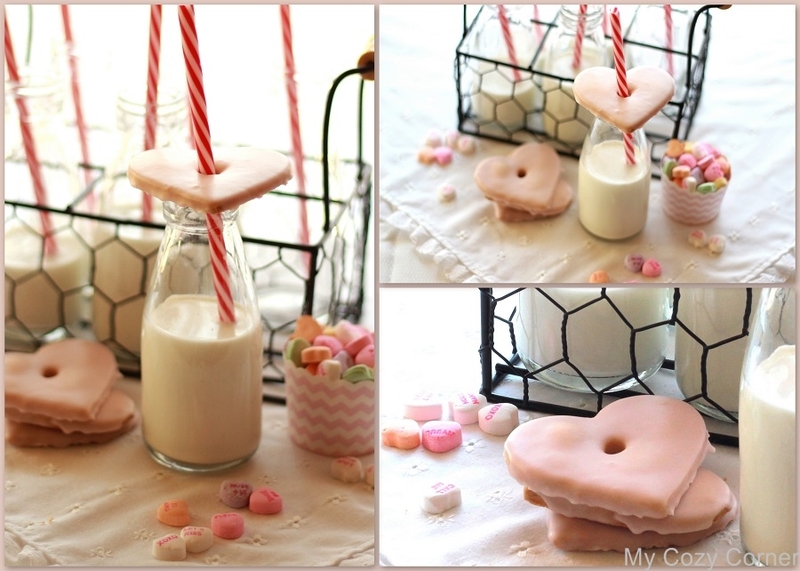 Be sure to check out my Valentine Day Tablescape! The cookies look good!! We are ordering in from our favorite Italian Eatery for Valentine's Day!! Thanks so much for stopping by!! That's just as cute as a button! Reminds me of the soda shops. Very cute! Thanks for sharing at Home Sweet Home! Happy Pink Saturday, Betty. I definitely should have headed to your house for Valentine's milk and cookies. Your photos are stunning.